It seems likely that no matter what he does, Ritchie Blackmore will always be most recognized as the guitarist for Deep Purple. But he has also become a prominent player in the folk rock/Neo Medieval musical style with his group Blackmore’s Night, which has been around since 1997. The band has gained quite a following over the decade it has been around, and are now on their seventh studio album Secret Voyage. And although fans still holding out hope for something in the style of Rainbow or Deep Purple will once again be disappointed, newcomers looking for good folk inspired rock or long time fans will find that even after seven albums Blackmore’s Night isn’t any less interesting to listen to. One element that listeners may notice is that this time around the group offers a mix of medieval sounding tracks and some contemporary ones. In addition to some covers of some traditional folk music (“Locked Within the Crystal Ball is from the fourteenth century) and some originals, Blackmore’s Night also threw in a cover of a Rainbow song (“Rainbow Eyes”) and even an Elvis Presley cover. This may seem a little strange for a group that has traditionally stuck to Celtic and Medieval styles but Ritchie Blackmore and his band of musicians have added their own unique touch to each tune. If you haven’t yet heard an album from this band, expect light and sometimes epic riffs combined with traditional instruments to create a Medieval/Renaissance sound. With Secret Voyage, the group has moved only slightly away from the styles that they started with but continue to be one of the top acts in their genre. Candice Night has always been one an underrated vocalist, as she has a great voice that really stands out from the rest. Her singing is full of melody, and she is able to sing in such a way that listeners are given the illusion that this album was actually composed in Medieval times. As the music is extremely light in nature, it really gives Night the chance to shine and she definitely rises to the task throughout the course of Secret Voyage. While there are a number of Celtic/Renaissance vocalists out there Candice Night is arguably one of the best out there right now and hopefully with this release she will finally be noticed. 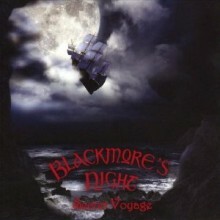 If you haven’t been able to get into Blackmore’s Night before, Secret Voyage won’t be able to change that. But if you’ve enjoyed any of the group’s previous work or are looking for another folk rock band to get into then this disc is definitely worth picking up. It is debatable as to whether or not this is Blackmore’s Night’s best album yet, but there is no denying that the band hasn’t put out a bad release yet. This is a disc that listeners will be putting into their CD players for quite some time in order to get their regular Neo-Medieval fix, and that in itself should speak volumes for Ritchie Blackmore and his band of minstrels.